TNR: How's the laughter business going? MW: It’s like a Wonder Bread factory. It’s making lots of dough. Ba-dum ching! TNR: I talked to Sulley a few weeks back and he told me I should ask you about the "banana republic incident". What's that about? MW: Of course he did, the big oaf! He came out looking great, and I … well, let me explain. Sulley and I had an interview with Good Morning Monstropolis about the Broadway premier of our musical, “Put That Thing Back Where It Came From.” We decided to get some new clothes for the interview, so we went to the Banana Republic website. Immediately I noticed that the first two links, right below their logo, were Men and Men’s Big & Tall. I spent the next 30 minutes searching for a link to Men’s Short & Squatty. Well, do you know what? There wasn’t one. I know what you’re thinking, and I was offended too. 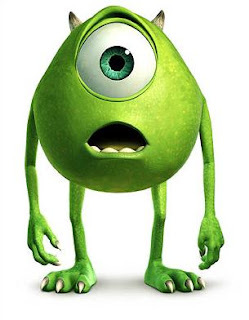 So I wrote them a harsh letter about discrimination, and sent in a photo of Sulley making his scariest face. They claimed they were very sorry, even though they never added the new link, and said that as compensation, they would feature me and Sulley on the cover of their next catalog. But wouldn’t you know, when the catalog came out, the address label was covering my entire face. So I’ve started sending monsters to the closets of the Banana Republic executives. TNR: I heard Henry J. Waternoose died earlier this year. Given the way things went down, how did you feel when you heard the news? MW: Well, considering he died while trying to sneak back into the Monster’s Inc. building, where he tripped onto a conveyor belt that lead to the trash compactor, I had a hard time holding onto my bitter feelings, knowing that he took his last breath as a cube of garbage. TNR: Have you kept in touch with Boo? MW: Oh, yes! As always, I came up with a brilliant plan. Together, she and I go around scaring the stink out of other monsters. You see, the rest of Monstropolis still thinks that little girls are killing machines. So, I sneak Boo into random monsters’ closets, she comes out, goes “Ah-la-la-la-la!”, sticks her tongue out, blows a raspberry, giggles, and runs back through the door. The two of us have Monstropolis in an uproar! TNR: So is that mostly what you do when you’re not popping out of kids closets? MW: That, and tricking other monsters into doing my paperwork. TNR: After the recent E. Coli scare a couple months back your company banned the use of certain breath mints while on the job. What flavors did you have to do away with? MW: Other than Wet Dog, and Low Tide, we’ve added Sour Milk, Pig Bile, Formaldehyde, and Onion Breath. TNR: I heard you're planning on opening up a seasonal B&B with your wife. When can we expect to see the opening? MW: Celia and I are still working out the details. TNR: Who were your heroes growing up? MW: Two come to mind. The first is The Wicked Witch of the West. Now there’s a real pro. She could have lit up a whole city block with the terrified screams she got out of poor innocent children. She was truly someone to aspire to. My other hero was Billy Crystal. The talent, the comic timing, and that fantastic voice. If only I could have been more like him. TNR: A couple years ago there was a huge scandal relating to you and and Sulley in a fender bender. Would you care to set the record straight? 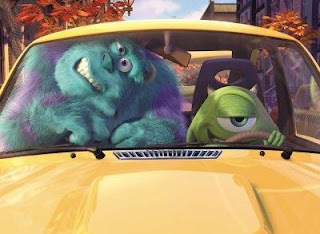 MW: That never would have happened if Sulley had been paying attention. Of course, the snow cones were also partly to blame. TNR: If Heaven exists, what would you like to hear God say when you arrive at the pearly gates? MW: "You were the best dodge-ball you could be." If any of you would like to participate in a future non-interview just let me and we'll set it up. Great interview, guys. I'm offended, too, that's there's no Short and Squatty store. haha, this is great!! i would totally be down for helping you with something in the future (but i dont know how funny i'd be...). all in all very entertaining! Would you believe....(of course you would)....that I haven't seen this movie yet?!! Maybe someday Mike will be more like Billy. 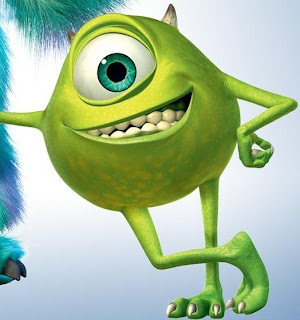 I can't wait for Monsters Inc. 2. I hope Pauly Shore is in it. I would love to participate in another non-review if no one steps up. haha nicely done @Stake and Mr. Non-Review. Since I got to do one of those I like to try and figure out which were the answers you had to make up questions for. It's a fun game.